The Giro d’Italia’s 99th edition begins on the 6th May with the first three stages taking place in the Netherlands and including an individual time trial. The first grand tour of the year will include seven sprint stages, three time trials and nine summit finishes making it one of the hardest races on the cycling calendar. Of the 19 stages there are four big muontain stages that are guaranteed to see some action including the Corvara, Alpe di Siusi, Risoul and Sant’Anna di Vinadio. 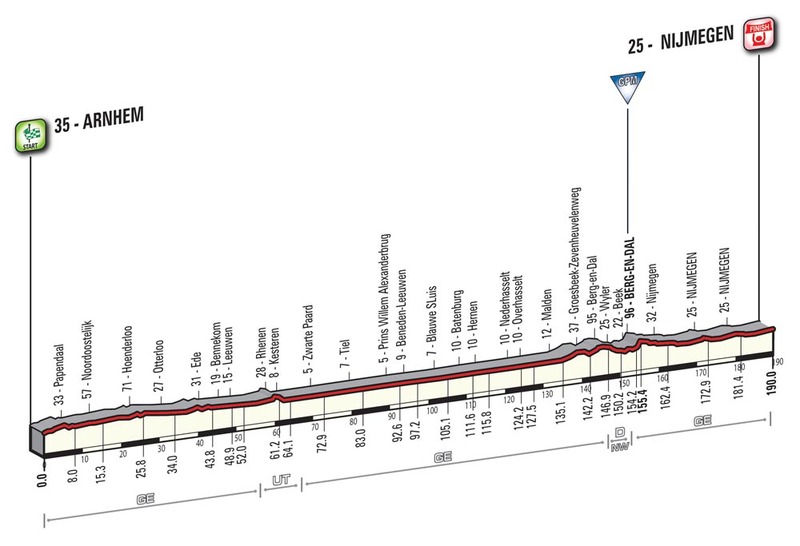 Stage 1 is a short 9.8km individual time trial around Apeldoorn which will be a good opportunity for a time trial specialist to take the first maglia rosa of the race. Stage 2 and 3 will take place in the flatlands of the Netherlands from Arnhem to Nijmegen and then Nijmegen to Arnhem respectively, both 190km, making them ideal targets for sprinters. The back to back nature of these two stages may mean that on Stage 3 we see something a little different from the peloton as riders have a rare chance to go over the same roads as the previous stage. Stage 3 could certainly be a breakaway stage if a good group get together. 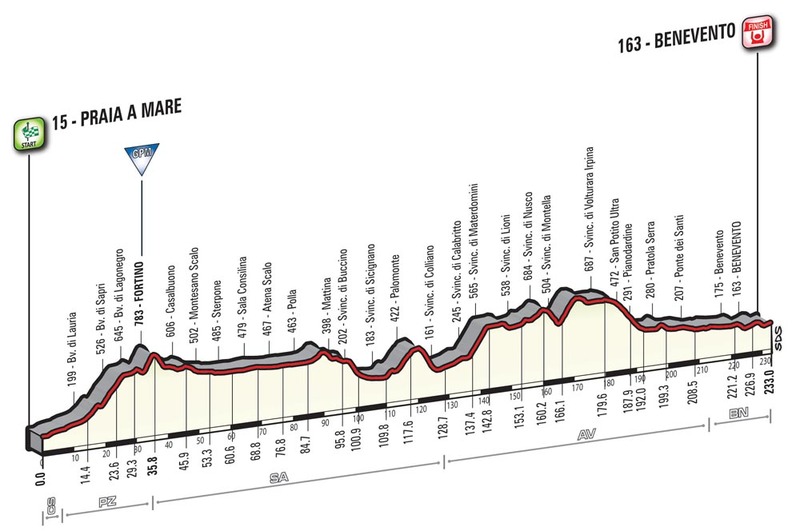 After Stage 3 the race moves into Italy after the first rest day as the Giro caravan flies down to the toe of Italy where the course will work it’s way back up to the North. This is unusual in the Giro which normally works its way South then back North, with the 2016 edition set to finish in Turin. Stage 4 is another flat stage from Catanzaro to Praia a Mare with a couple of category 3 climbs thrown in to mix things up a little. This should be another stage for the sprinters although with the majority of climbing coming in the last 80km and an uncategorised climb within the last 10km there could be a chance for a solo rider to cause an upset. 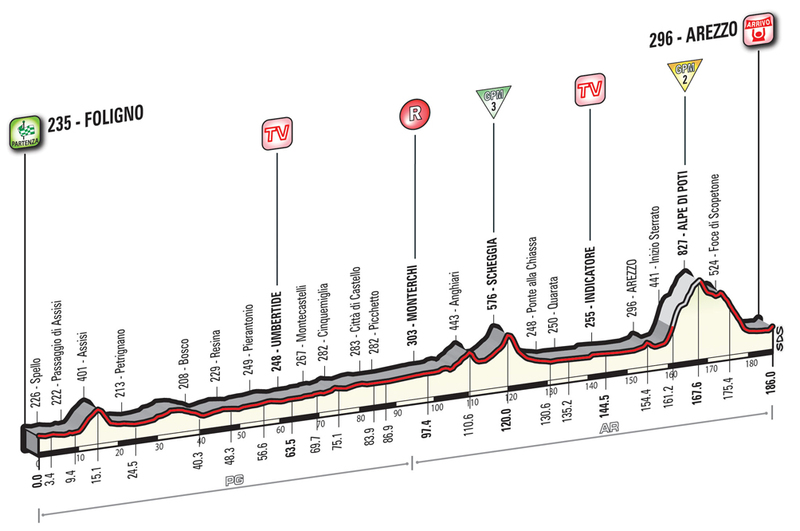 Stage 5 is the Giro’s second longest stage at 233km and although there isn’t much categorised climbing there are plenty of uncategorised climbs throughout the stage which are certain to have an effect on the sprinters towards the finish which could see an opportunistic puncheur take advantage of the tired sprinters. 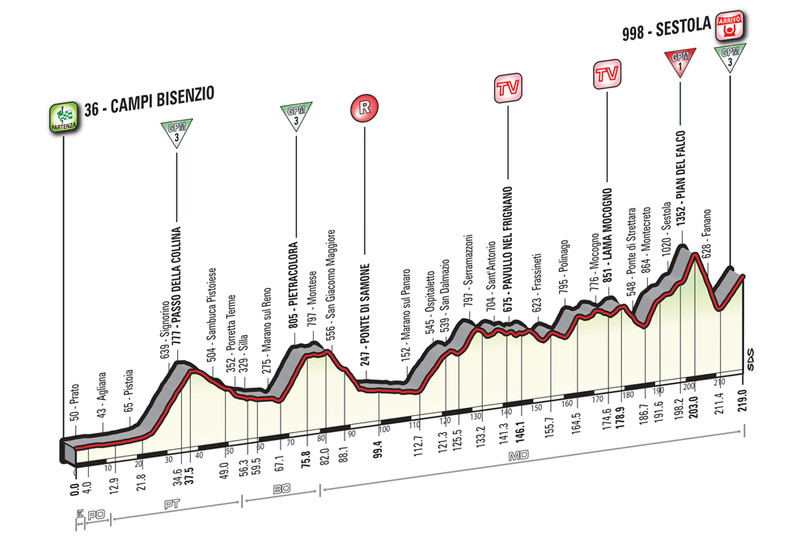 Stage 6 moves into the Apennine mountains for the first mountain finish of the Giro and is likely to be filled with GC attacks as the top contenders try and stamp their control on the race. 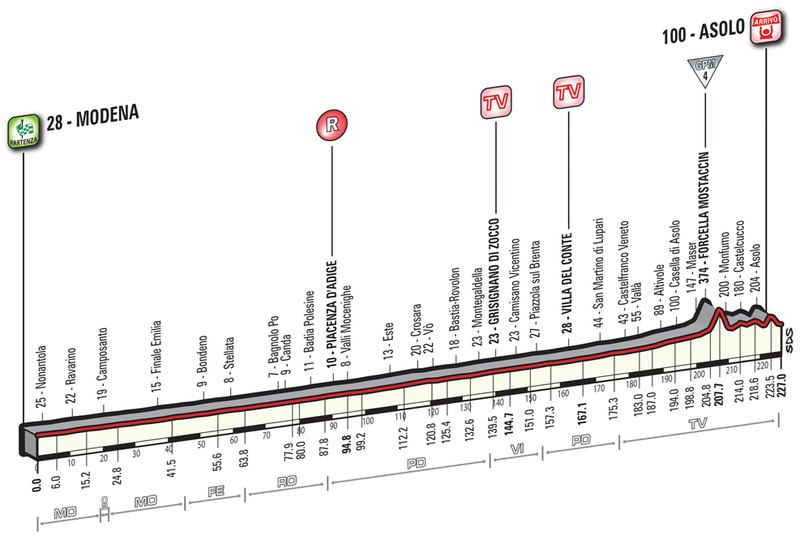 The maglia rosa is almost certain to change hands on this stage, which could be a defining moment of the race. 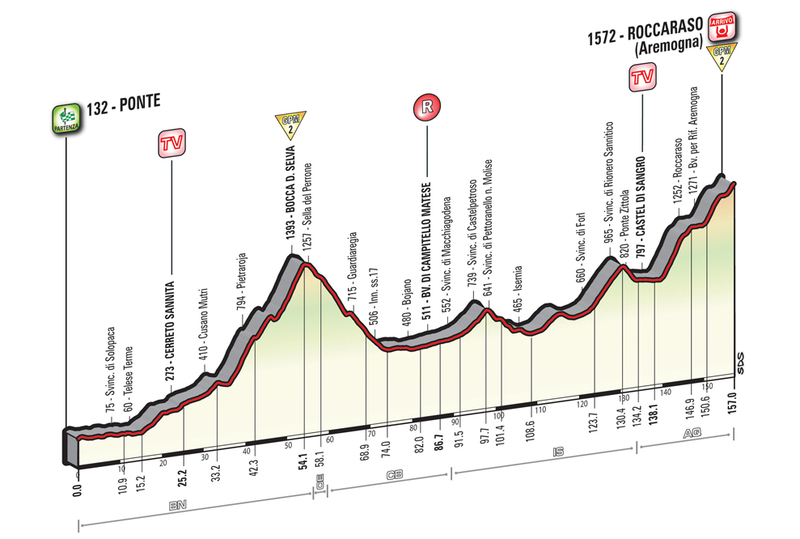 Although only 157km long it includes the category 2 Bocca di Selva and finishes on the category 2 Aremogna in Roccaraso. Stage 7 offers some respite for GC with the sprinters having another chance to add more points to their totals in the competition for the points jersey. The 211km long stage from Sulmona to Foligno begins hard with the climb of the category 2 Le Svolte di Popoli but then levels off for the rest of the race with only a category four climb to content before a pan flat 15km run into the finish for what will likely be a bunch sprint. Stage 8 takes in some of the dirt roads – or strade bianchi – of the Umbria region that make up the famous classic that takes place in March. 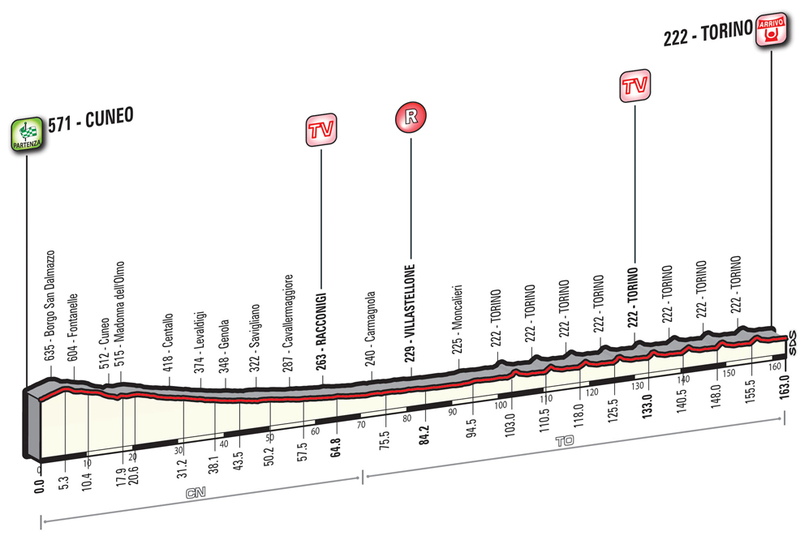 The stage would be a guaranteed sprint finish with hardly any climbing if it weren’t for the addition of the category 2 Alpe di Ponti which comes just 17km from the finish, giving the GC a chance to alter the podium once again if they can get away on the climb and stay away on the descent. Stage 9 is guaranteed to shake up the GC with a 40.5km mountainous individual time trial. Whilst no categorised climbs appear on the route a glance at the profile shows that there will be plenty of work to do for the GC riders and those looking for stage honours. The maglia rosa is likely to change hands again here and this could be a crucial stage in the race that could make a difference in Turin. Stage 10 sees the race head back into the mountains after the second rest day as it heads from Campi Bisenzio to Sestola with the climb of the category 1 Plan del Falco which comes just 20km from the end of the stage with the climb up to the summit finish at Sestola making it a tough day for whoever is in pink. Attacks are surely to come thick and fast on the Falco with the chance to take time out of the leader on the category 3 climb up to Sestola if they can get a substantial gap. Stage 11 is a pan flat stage which will have interested the sprinters until they saw the final 15km. Although it only has a category 4 climb to deal with the undulating terrain is constant and sprint teams are likely to struggle to keep their men up front, making this stage prime for the taking by a breakaway rider if a break can stay away long enough to make it to the first climb with a decent gap to the peloton. 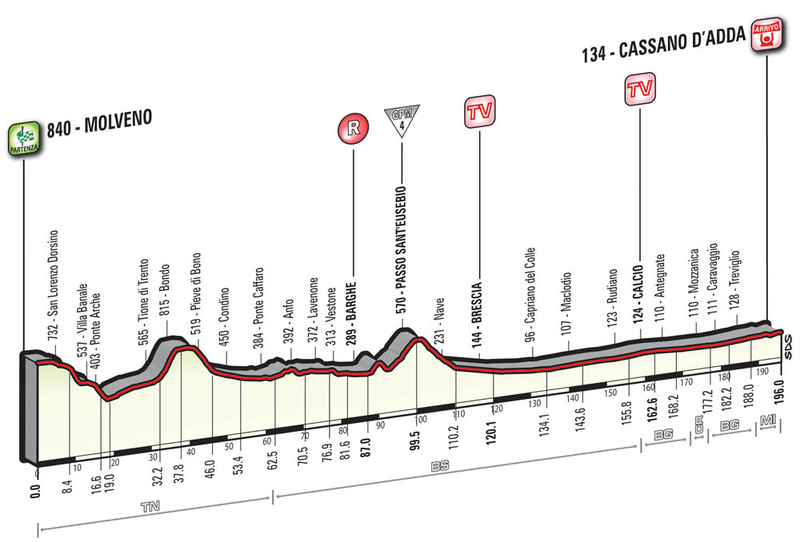 Stage 12 is the most straight forward sprint stage you will ever see at the Giro, with no climbs or even undulating terrain to speak. This stage is one of the last chances for sprinters to take a stage and a rare chance for the pure sprinters – those who find themselves distanced on climbs – like Greipel and Kittel to shine; provided that they have managed to stay in the race this long. Stage 13 proves that the flat day before was the calm before the storm two category 2 and two category 1 climbs to deal with. The first climb after the start in Palmanova is the category 1 Montemaggiore after 50km which is immediately followed by the category 2 Crai. The race quietens off for another 40km until the category 1 climb of the Cima Porzus which is immediately followed by the category 2 Valle. The Valle climb summits just 14km from the finish making this another potential stage for a late breakaway or keen rider to take a stage and put time into his rivals. 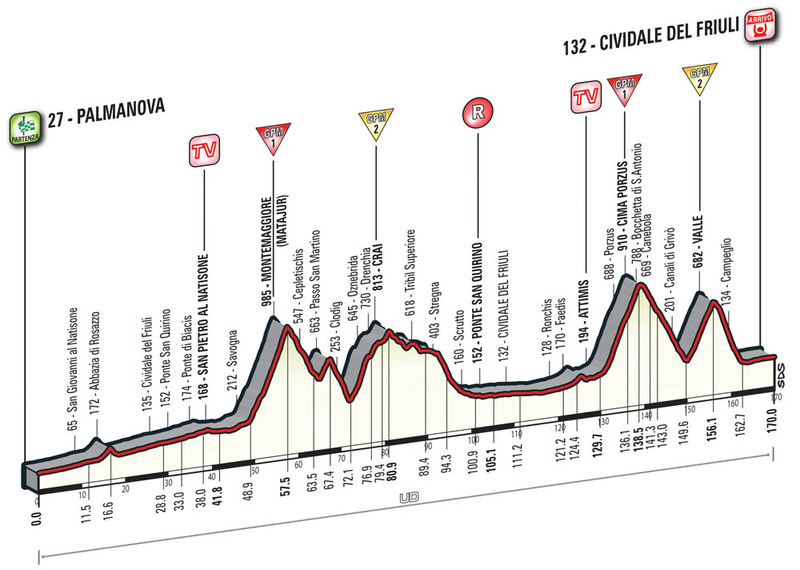 Stage 14 is the Queen stage of the Giro and includes some serious climbing. There are two category 1 climbs, three category 2 climbs and one category 3 climb which the riders will face when they roll out from Alpago. 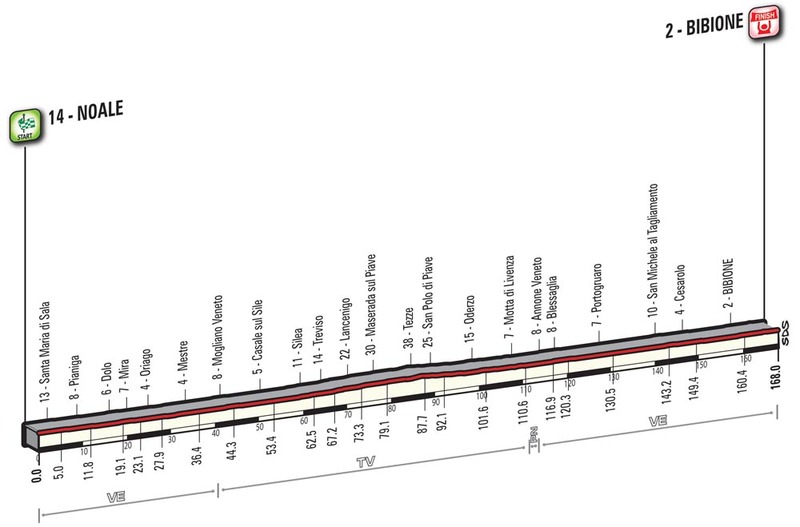 The first climb is the category 1 Passo Pordoi and kicks off almost 50km of continuous climbing and descending. This bunch of climbs in the middle of the stage will be a juicy prospect for anyone targeting the King of the Mountains competitions to try and get in a breakaway and hoover up as many points as possible. Immediately after the Pordoi comes the category 2 Passo Sella, followed by the category 3 Passo Gardena. After a short descent the category 2 climb of the Passo Campolongo finishes off the climbing for all of 27km before they take on the category 1 Passo Giau which is followed by the category 2 Passo Valparola. The summit of the Valparola comes 20km from the finish and with a long descent, expect GC moves to be made on this climb. Stage 15 is the final time trial and one which will again shake up the times on the GC. The short 10.8km route takes riders up the Alpe di Siusi – a category 1 climb that has a max gradient of 11% which comes near the top. 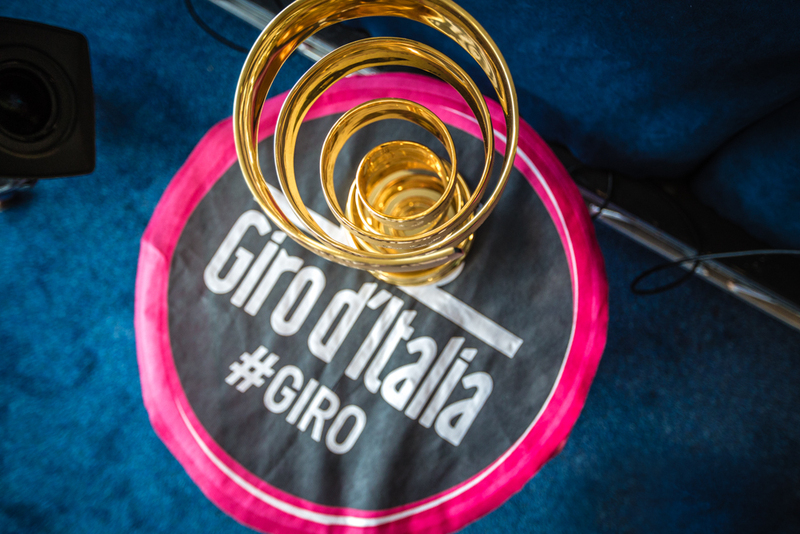 This is where the winning moves of the Giro may be made, expect a different looking GC by the end of this one. Stage 16 is a short stage as far as grand tours go at just 132km from Bressanone to Andalo, but the category 2 climbs of the Passo Della Mendola and the Fai Della Paganella are likely to cause plenty of fractures in the race, especially after a brutal couple of days in the mountains. 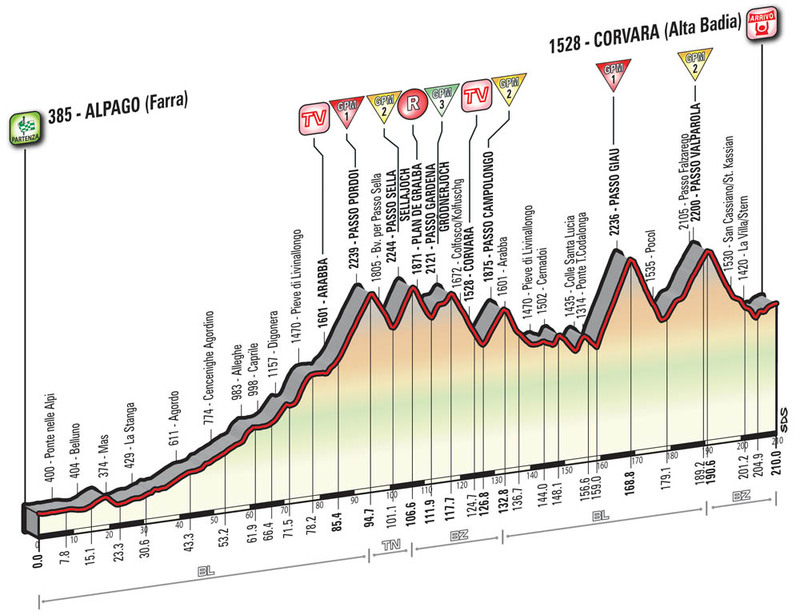 The Fai Della Paganella summits with just 8.5km to go before the finish and with undulating terrain this could be an opportunity for a puncheur to take the stage if they have managed to stay near the front for the mountain climb. 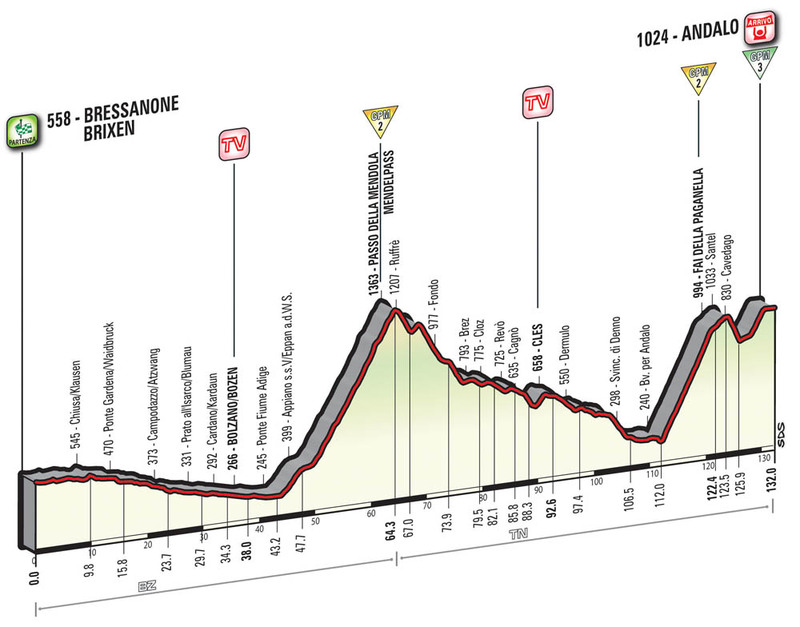 Stage 17 provides a respite for the riders whose legs have been pummelled after an intense week of mountains, with a 196km flat stage from Molveno to Cassano d’Adda. 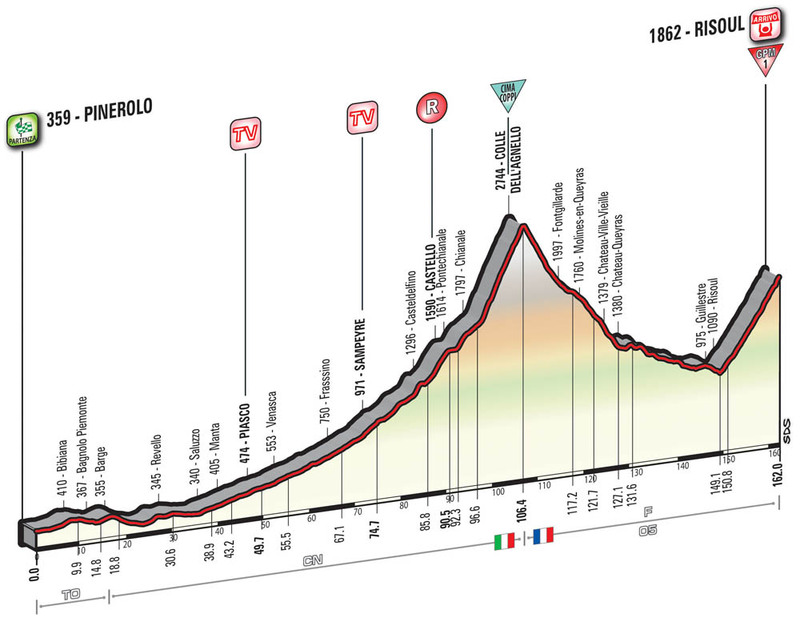 The only bit of climbing the riders face is a category 4 climb halfway through the stage, with the final 76km being flat enough to almost guarantee a bunch sprint – the last chance the riders will get before Turin. Stage 18 is a transitional stage as the race heads towards the Alps. 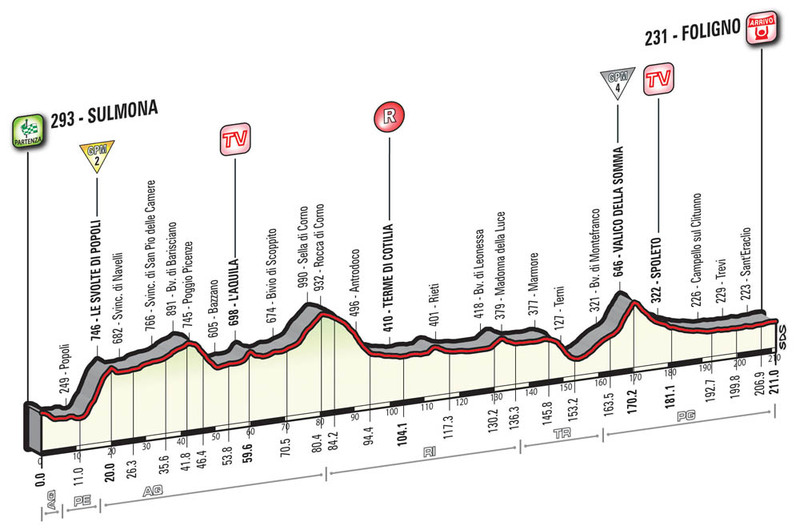 The longest stage of the Giro is flat for the first 200km but as the race moves into the foothills the terrain starts to get hillier and with 25km to go there is the category 2 climb of the Pramartino which may be tempting for some riders but it’s likely the GC will keep a close eye on each other and save their powder for the mountains ahead. 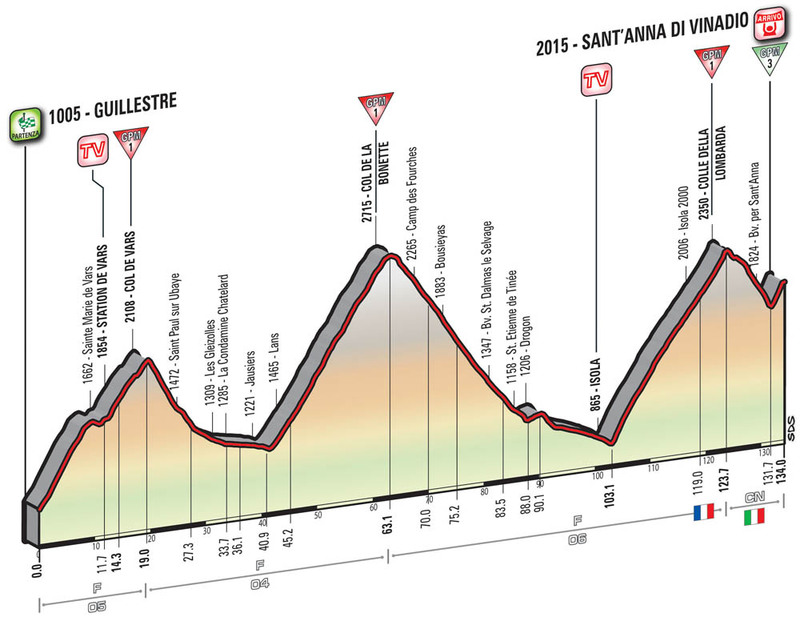 Stage 19 is the first real alpine stage with two category 1 climbs to tackle including the summit finish on Risoul. This stage is all about the two climbs, beginning in the foothills of Pinerolo below the category 1 Dell’Agnello – which holds the mantle of Cima Coppi, the highest point of the race – before climbing and descending the mountain and tackling the Risoul immediately afterwards. If time gaps are big enough, expect to see some attacks from the GC on the Risoul as competitors try and pull time back or put more time into their rivals. 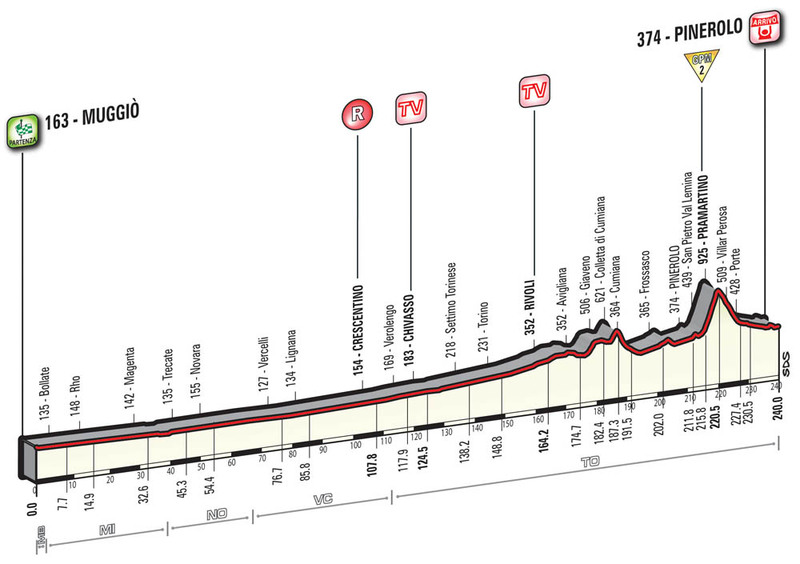 Stage 20 is the last chance for GC rivals to make up time on their rivals and the last battle for the maglia rosa in this year’s Giro. With three category 1 climbs finishing with a summit finish on the category 3 Sant’Anna Di Vinadio, there is plenty of chances to attack and make time. The first two climbs are the Col de Vars and the Col de la Bonette and will be there for consolidation in the King of the Mountains competition unless it’s already been won. The final category 1 climb is the Colle della Lombarda, the descent of which leads straight into the final climb, so expect this to be the final battleground for the GC to make their escape and recover their time deficit or for the winner to take the race in style. Stage 21 ends the race similar to the way the Tour de France ends, with a flat stage finishing with a circuit around Turin that will likely end in a bunch sprint. This stage is treated like a ceremonial affair with the race really beginning as the riders hit the finishing circuit.